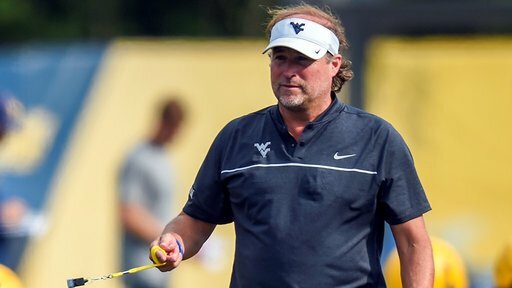 It’s no secret that Dana Holgorsen’s name is attached with the Air Raid. He consistently runs 66 (slot fade), 6 shallow (shallow cross), 617 switch (scissors), 92 (mesh), 95 (y-cross), 96 (curls), 98 (smash). As you can see, Dana stays true to his roots. 96 consistently showed up every week, so we wanted to take a look at why this play is so successful. Below, you’ll see the install of 96 with Mike Leach when he was at Oklahoma. Mike Leach still runs this concept very consistently at Washington State. 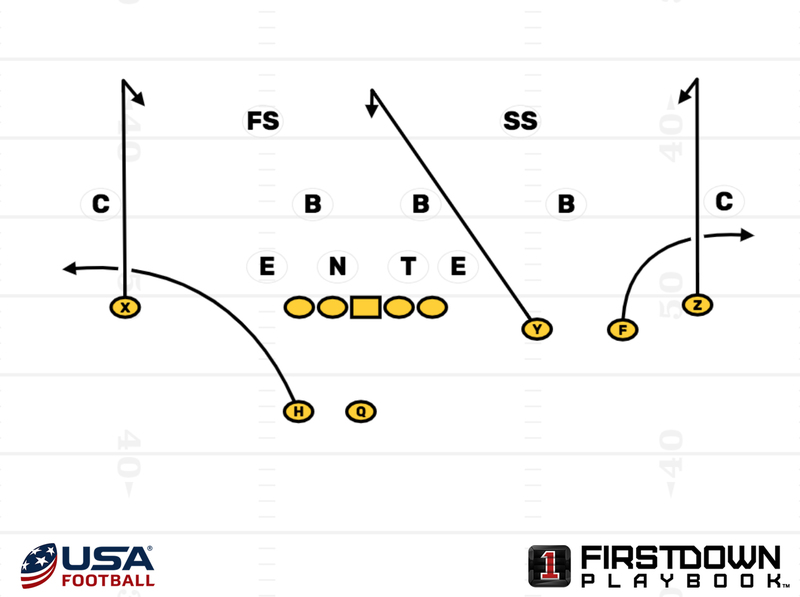 In the Air Raid, QB’s are taught to progression read. In this concept, it doesn’t change. Note under “QB,” Leach teaches his QB to read the WR tagged after 96. If the call is “96 X,” the read will start with the X then to the H. His progression will finish with the Y and Z. In this concept, you are stretching the defense horizontally with the entire use of the field. Both the X and Z receivers should run a 13- and 10-yard curl, respectively, with an inside release. 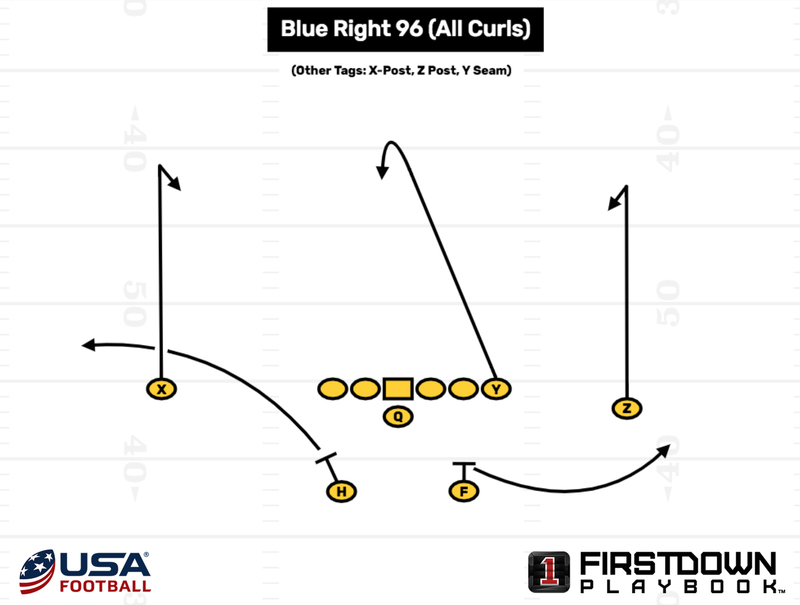 The Y WR will run an 8- to 15-yard curl taking an outside release. The H and F below run shoot routes. In West Virginia’s case, the No. 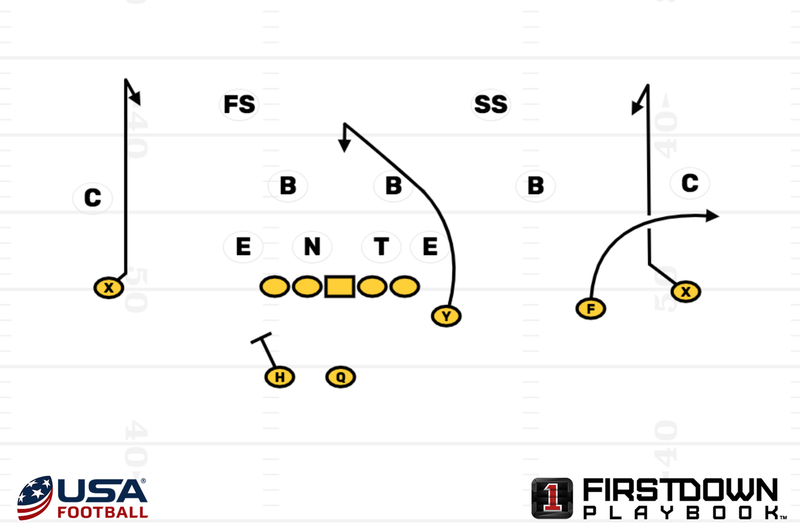 2 receiver will run the same concept (out route). In this clip, the QB starts his progression with the X (96 X). With the corner playing man on the X and gaining no separation, the QB moves on in his progression and hits the Y. Texas changes their defensive alignment and tries to play man. The progression will not change in their system if you try and play different coverages. A simple concept that is efficient. West Virginia will also run 96 out of 11 personnel. Below you’ll see 96 from a trips set with a FB. Both the X and the Z receiver will run 13- and 10-yard curls with an inside release. The No. 2 receiver will still run the out route (shoot), and the wing (FB) will be the curl that settles in the middle of the field. The QB starts his progression with the X receiver, so the call would be 96 X. The only difference is that they keep the back in for protection. Again, a simple concept that’s QB friendly. Even though Dana Holgorsen has moved on to Houston, his offensive success will likely remain. He has been at the forefront of offensive innovation, especially toying with the Air Raid offense to fit his personnel.